A Harvard University student newspaper has called for more diversity in hiring professors after a survey showed how overwhelmingly left-leaning the institution is. Student paper The Crimson surveyed nearly all 1,000 of the professors and part-time lecturers at the Faculty of Arts and Sciences, the largest of Harvard’s seven. The paper found that over 83 percent of those surveyed identified as liberal or very liberal, while only about 1.5 percent of lecturers identified as conservative or very conservative. More faculty members voted for third-party presidential candidates Jill Stein and Gary Johnson than for Donald Trump. By comparison, the general American population was 35 percent conservative, 35 percent moderate, and 26 percent liberal in 2017, according to Gallup. 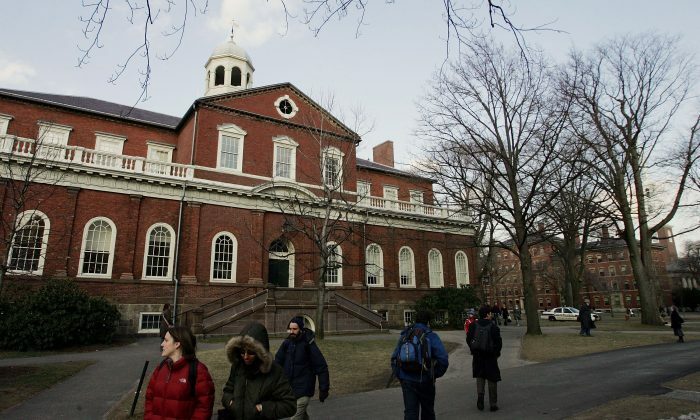 The newspaper opined in a May op-ed by its editorial board majority that the lack of conservative thought hurts Harvard. It also suggested a way to address the problem. “We believe the university must emphasize hiring professors with diverse beliefs and backgrounds who can challenge prevailing campus ideas through tough ideological conversations,” it stated. While the Harvard example is especially striking, colleges lean strongly left in general. About 12 percent of undergraduate faculty identifies as conservative, compared to almost 50 percent liberal. Another 11 percent identify as “far left” compared to 0.7 percent “far right,” according to 2013–2014 data by the University of California–Los Angeles Higher Education Research Institute, which polls thousands of lecturers at hundreds of colleges across the nation every three years. Private universities employed faculties that were nearly 16 percent conservative but also nearly 15 percent far-left. The bias dates back decades, though it didn’t use to be so glaring. In 1989, colleges had about 18 percent conservative faculty, and in 1992, that increased to over 21 percent. Since the late 1990s, however, the ideology has shifted further to the left; the percentage of faculty on the far-left more than doubled since the early 2000s. The higher acceptance of far-left ideologies has given more credence to violent leftist groups like Antifa, which operates and recruits on campuses across the nation while espousing a mix of anarchist and communist doctrines and operating like a guerrilla army of masked individuals who mix in with other protesters. The Crimson piece states that “initiatives to promote campus conversations in which beliefs are questioned should be encouraged.” Recent years have seen the opposite, with a trend of angry mobs trying to stop conservatives from giving speeches at universities. Heather Mac Donald, an expert on policing and a critic of far-left group Black Lives Matter, had to cancel her speech at Claremont McKenna College in California last year after a mob of protesters shut it down. Also last year, Charles Murray, the author of “The Bell Curve” and “Coming Apart,” was met with a violent mob determined to prevent him from speaking at Middlebury College in Vermont. “The people in the audience who wanted to hear me speak were completely cowed. … A campus where a majority of students are fearful to speak openly because they know a minority will jump on them is no longer an intellectually free campus in any meaningful sense,” he wrote in a commentary. The protests were organized with the encouragement of several faculty members, he said. Even among liberals, those not considered far enough left have sometimes faced attacks, like Evergreen State College biology professor Bret Weinstein, who spoke out against an event that asked all white people to leave campus for a day. He considered the request antithetical to his liberal ideals and was harassed by a mob of students until he quit. He later sued and received a $500,000 settlement from the school. President Donald Trump spoke on the issue of stifling free speech at colleges when he addressed student leaders and other young people during the event “Face-to-Face With Our Future” at the White House on June 27. “We believe in free speech on college campuses, not censorship,” Trump said. “Institutions of higher learning should be forums for open discussion either way. You can be liberal, you can be conservative, you can be Democrats, Republicans. Hear it all out—and you make your choice.